2) Getting to meet my sweet baby niece, who decided to wait until the night I left for vacation to be born. Lil' stinker. Of course I forgave her as soon as she was in my arms that first time. And just like she was impatient to enter this world, I'm impatient for her to be able to ride a bike :) I can't wait to take her on many biking adventures. She's going to be a cyclists for sure. 3) Starting a new job in Iowa city! It's hard to believe what a huge positive impact this has had on my life. I get to ride my bike to work everyday (awesome!) and no longer have a stressful commute. I love my job (didn't think that was possible) and even got to join a bicycle advisory committee as part of my job. How cool is that?! Some of my favorite ladies to race with! 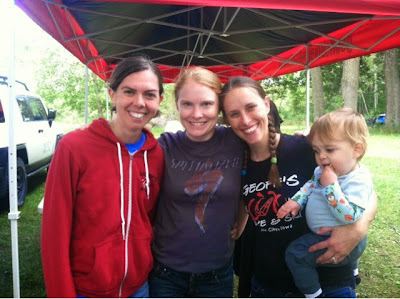 Hanging out post race with Britt, Robin, and baby Niels. 7) Getting 3rd place at the Iowa State Championship Road Race. Up until this point I didn't really feel like I belonged on the elite team. Working together with teammates and being able to put out more effort that I thought possible got me to the end. It was an incredible feeling crossing that finish line and knowing that my team took the top 3 spots. 8) I was utterly spoiled this year by also getting a new carbon 'cross bike. Oh boy can I tell the difference riding on that compared to my old aluminum frame! I'm going to go ahead and credit my new bike with how much better I did this year in 'cross. 9) Jingle Cross. It's always a struggle to not come in last racing against some of the top women across the county. With the crowd this race draws I'm usually happy to finish ahead of a few people. I was in for a surprise this year when I finished 6th place - two days in a row! 10) All of the above helped me end the season ranked 7th in the country for cat 1 cross country racing and 34th overall- holy smokes I didn't think that was possible! See what I mean by how hard it will be to top this past year? I hope you too had a wonderful 2014 and will have an even greater 2015!